Hallucinogen and alcohol abuse is spawned from the need to attain a level of high or euphoria. Many people indulge in various forms of drug abuse like hallucinogens, inhalant, and mixes such as marijuana and alcohol to increase the effect of the drug. Teenagers illegally purchase and party with easy-to-get drugs ranging from hallucinogen mixes like ketamine and ethanol to antidepressants such as morphine and alcohol to get into the “groove” this, of course, comes with negative health implications especially when highly potent hallucinogens are involved, such as mushrooms and alcohol. So what are the effects of various hallucinogens on the body when mixed with alcoholic drinks? How does the combination of hallucinogens and drinking affect health? What is the statistics of hallucinogens and drinking? Is bad trip from alcohol and hallucinogen combination possible? What is a serotonin syndrome as a result of drinking on hallucinogens? Hallucinogens are obtained from 3 sources; plant, mushrooms, and man-made chemical compounds. The solids or extracts swallowed in solid or liquid forms, snorted, injected intravenously, inhaled, and absorbed into the body through a laced medium. The health effects of mixing shrooms and alcohol or other forms of hallucinogens can be unpredictable especially since the potency of the substance varies with amount ingested, tolerance of the user, mental state and human factors such as weight, gender, and others. Shrooms and alcohol mix can last for a good number of hours, depending on the amount ingested. Here are a few alcohol and psychedelics mix and their health problems. Alcohol and ketamine enhances depressant effect and the inhibition of excitatory neurotransmitters is increasing the risk of driving or handling heavy/fragile machines. Ketamine alcohol withdrawal can be achieved with treatment interventions to avoid relapse or overdose due to tolerance built. Psilocybin, also called magic mushroom, is a psychedelic schedule I compound that was recently approved for medical purposes for treatment of OCD, depression, addiction and others. Shrooms alcohol mix can lead to addiction due to its psychedelic effect and its ability to numb emotional pains. Addiction to shroom and alcohol presents with mushroom trips and hallucinations as well as flashbacks even while sober. “Psilocybin-assisted treatment for alcohol dependence: a proof-of-concept study” shows that psilocybin has shown promise as a cure for alcoholism.Alcoholics that received dosages of psilocybin were reported to reduce drinking significantly. This was also reported for other addictions like smoking. What makes alcohol and mushrooms so bad? Mushrooms are a class of hallucinogens; these are substances that interfere with brain functions and have the ability to alter the nerves, chemical responses, and perceptions, creating a euphoria that increases imaginary sensations. Certain things that seem real may be unreal and vice versa. Alcohol and shrooms ingested together creates an elevated feeling well beyond safety limits and has extreme psychological effects that may be life-threatening. On the onset, alcohol may help in decreasing the negative effect of mushrooms such as paranoia and queasiness, but this feeling quickly develops into something unhealthy and highly toxic. Psilocybin aka Magic mushrooms and alcohol, is commonly used among young adults for pleasure. 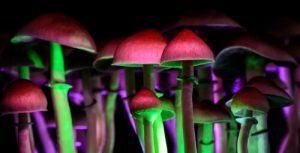 This is often problematic as psilocybin and alcohol is addictive and can cause high levels of intoxication, psychological distress, and increases suicide tendencies. Misuse of Psilocybin alcohol extraction can lead to “bad trips” and affect serotonin levels. In the 2004 national drug use survey in Australia, it was found that 5% of the population between the age range of 14 and above had used hallucinogens at least once, with peak usage at ages 20-29. Reports in 2013 on alcohol hallucinogens use have shown that LSD, PCP, and salvia were popular amongst Americans students aged 12 and above. Other countries with high prevalence include Brazil, Germany, Columbia, and many European countries. Ayahuasca users, in comparison with other alcohol with hallucinogens combo, reported lesser side effects, even though further research is ongoing. Alcohol and shrooms are very common in the united states especially with college students aged 18-22. In 2014 one-third of the 12.4 million populations of college students in the United States had engaged in Ritalin and alcohol as well as other illicit drugs such as marijuana, hallucinogens, stimulants, and others. The Substance Abuse and Mental Health Services Administration (SAMHSA) in conjunction with the Center for Behavioral Health Statistics and Quality (CBHSQ) have emphasized that drug combinations such as mixing alcohol and sleeping pills or any other form of the drug are harmful to health. Hallucinogens may sometimes create adverse effects which stress the CNS using anxiety, intense hallucinatory effects, paranoia, bizarre behaviors such as panics and suicide attempts. Delusions may last longer than normal depending on individual factors. These negative conditions are referred to as bad trips. It can last for several hours and varies with the amount of substance used. When hallucinogens such as LSD and shrooms are used with alcoholic drinks by people who want to amplify their experience, often trips present with visual and auditory hallucinations imposing a feeling of fear and panic. After effects are insomnia, time loss, dry mouth, erratic changes in blood pressure and heart rate, vomiting and nausea, appetite changes, high impulsivity, and in extreme cases self-inflicted injuries, and suicide attempts. This condition can lead to insanity and requires medical help. This condition requires immediate medical assistance as it could easily deteriorate into a life-threatening situation. 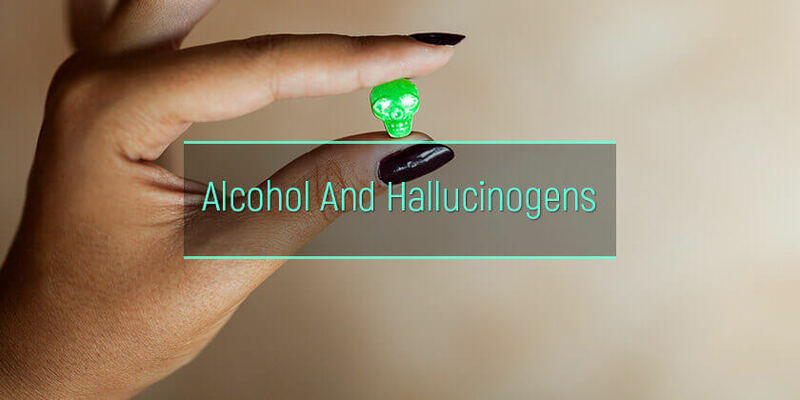 Frequent use of hallucinogens with alcoholic beverages can take a toll on the physical and mental health of the user. There are specific hallucinogens that are used as a treatment for alcoholism such as ibogaine however this substance is toxic to nerve cells when administered in large quantities. Most hallucinogens may not necessarily require detox, and they are not addictive but some of them, like the PCP, would require an inpatient/outpatient addiction program depending on the severity of the effect. Behavioral therapy, constant medication, and a support group would be effective to overcome the neurological effects of these drugs as well as full detoxification of harmful toxin and metabolites stored in the body.